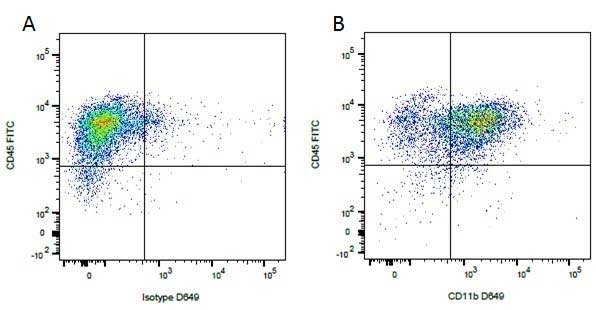 Mouse anti Canine CD45 antibody, clone YKIX716.13 (MCA1042GA) used as part of a panel of antibodies to demonstrate the phenotype of canine mesenchymal stem cells by flow cytometry together with mesenchymal markers CD9, CD44, CD90 and CD105. 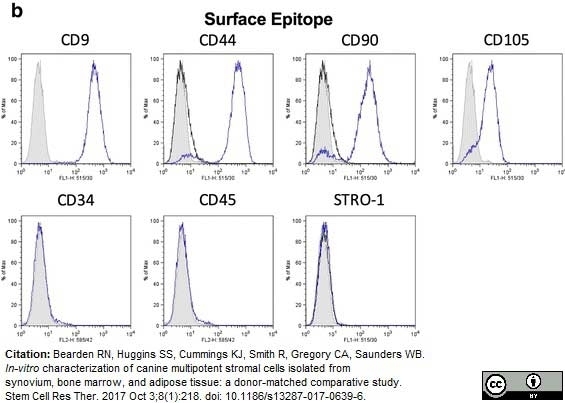 Negative results for lineage cell markers CD34, CD45 and STRO-1 are shown. Published customer image:Phycoerythrin conjugated Rat anti Canine CD45 antibody, clone YKIX716.13 (MCA1042PE) used for the evaluation of CD45 expression on platelet samples by flow cytometry. 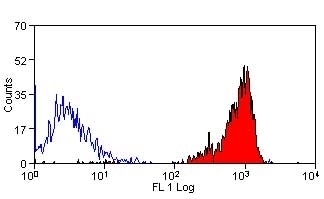 Flow cytometric analyses of optimized platelet samples after density barrier centrifugation. (A) Log forward and side scatter chart of platelet population (gated) with minimal contaminating cells. 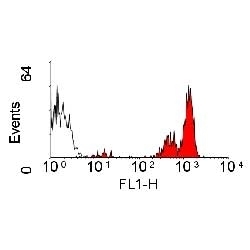 (B) Fluorescence chart of CD45 (FL2) and CD61 (FL1) antibody-labeled samples. Average CD61+: 99.47 ± 0.21% (n=3). Average CD45+: 0.19 ± 0.04% (n=3). (C) LeucoCOUNT chart for sample showing residual leukocytes (left gate) and LeucoCOUNT beads (right gate). From: Trichler SA, Bulla SC, Thomason J, Lunsford KV, Bulla C.
Ultra-pure platelet isolation from canine whole blood. BMC Vet Res. 2013 Jul 17;9:144. 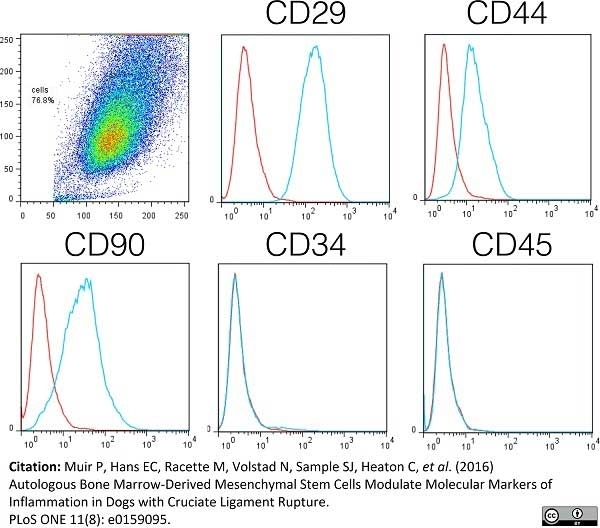 Mouse anti Canine CD45 antibody, clone YKIX716.13 (MCA1042GA) used for the evaluation of CD45 expression on canine bone marrow-derived mesenchymal stem cells by flow cytometry. Rat anti Dog CD45 antibody, clone YKIX716.13 recognizes canine CD45 also known as leukocyte common antigen lustered as Canine CD45 in the First Canine Leukocyte Antigen Workshop (CLAW). Clone YKIX 716.13: immunoprecipitates an antigen of ~180/200 kDa from Con-A blasts (Cobbold et al. 1994). CD45 is expressed on all leukocytes in canine peripheral blood. Rat anti Dog CD45 antibody, clone YKIX716.13 reacts with CD45 on all outbred mongrels and beagles tested and may be against CD45RB isoform. Spleen cells from immunised DA rats were fused with cells of the Y3/Ag1.2.3 rat myeloma cell line. Use 10ul of the suggested working dilution to label 100ul whole blood. Reis, A.B. et al (2006) Phenotypic features of circulating leucocytes as immunological markers for clinical status and bone marrow parasite density in dogs naturally infected by Leishmania chagasi. Tominaga, M. et al. (2010) Flow cytometric analysis of peripheral blood and tumor-infiltrating regulatory T cells in dogs with oral malignant melanoma. J Vet Diagn Invest. 22: 438-41. Hunter, M.J. et al. (2011) Gene therapy of canine leukocyte adhesion deficiency using lentiviral vectors with human CD11b and CD18 promoters driving canine CD18 expression. Comazzi, S. et al. 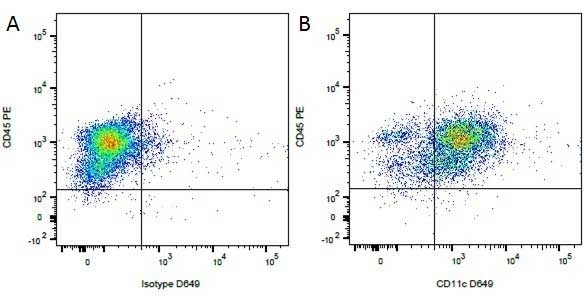 (2006) Flow cytometric patterns in blood from dogs with non-neoplastic and neoplastic hematologic diseases using double labeling for CD18 and CD45. Vet Clin Pathol. 35: 47-54. Giantin, M. et al. (2013) Evaluation of tyrosine-kinase receptor c-KIT (c-KIT) mutations, mRNA and protein expression in canine leukemia: might c-KIT represent a therapeutic target? Vet Immunol Immunopathol. 152: 325-32. Trichler, S.A. et al. 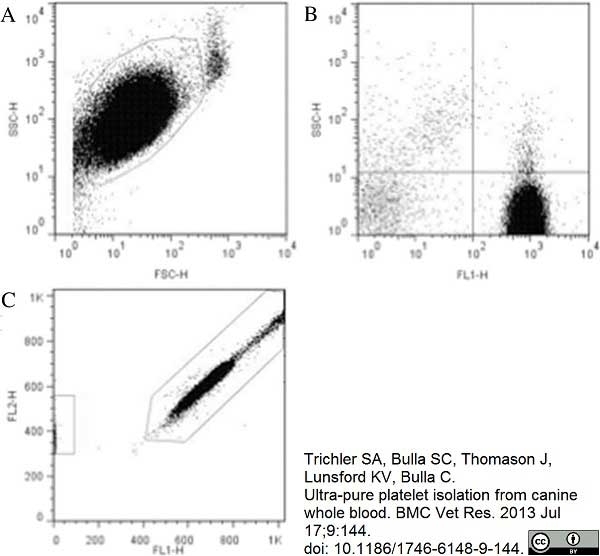 (2013) Ultra-pure platelet isolation from canine whole blood. BMC Vet Res. 9: 144. Salinas Tejedor, L. et al. (2015) Mesenchymal stem cells do not exert direct beneficial effects on CNS remyelination in the absence of the peripheral immune system. Brain Behav Immun. pii: S0889-1591(15)00233-0. Poggi, A. et al. (2017) Prognostic significance of Ki67 evaluated by flow cytometry in dogs with high-grade B-cell lymphoma. Vet Comp Oncol. 15 (2): 431-440. Zeira, O. et al. (2015) Adult autologous mesenchymal stem cells for the treatment of suspected non-infectious inflammatory diseases of the canine central nervous system: safety, feasibility and preliminary clinical findings. Mol Reprod Dev. 84 (4): 329-339. Lee, S.H. et al. (2016) Impact of local injection of brain-derived neurotrophic factor-expressing mesenchymal stromal cells (MSCs) combined with intravenous MSC delivery in a canine model of chronic spinal cord injury. Cytotherapy. Oct 28 [Epub ahead of print].